Sometimes it’s the stuff you don’t see that can cause the most damage. Take your teeth for example. Most people are reasonably careful when it comes to brushing; and that’s great. But ensuring long-term dental health requires daily flossing as well. Here are some important reasons why, as explained by a dentist in Aurora. Imagine what your mouth would look and feel like if you never cleaned 1/3 of your teeth. That’s a pretty good description of what happens when you fail to floss. Even the best toothbrushes cannot reach the crucial areas between your teeth. So, when you neglect flossing, you’re ignoring up to 35% of your tooth surface. This can lead to big trouble down the road. Many health experts believe that failure to floss causes most of the problems that send people to a family dentist in Aurora for treatment. You can do all sorts of things to make yourself presentable in public. You can brush your hair, wear nice clothes, stay fit, and bathe or shower daily. Yet, you may still repel those around you if your breath is objectionable. Sugar-free gums and mints are fine for treating the symptoms of this problem. But, to ensure it goes away, you must treat it at its source. Flossing removes contaminants from your mouth that can make other people turn away from you in displeasure. Gum disease affects up to one in eight Americans. Not only can this condition make eating painful, over time it may spread beyond your mouth, eroding the bones that make up your jaw. One of the most effective ways to help prevent this problem is to floss every time you brush. The few seconds you invest in this habit will pay off in rich rewards throughout your life. 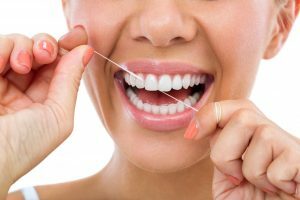 Move the flossing string up and down, not just side to side. This helps to remove more plaque from the surface. Never floss in a hurry. Take your time and work with care. Don’t like the floss are you using? Try another brand. You’ll find products with luxury wax coatings, sugar-free flavorings, and other nice touches. You can also ask your dentist to recommend a brand. Minor gum bleeding is normal when people begin to floss. However, continued bleeding can be a symptom of gum disease. If the bleeding becomes severe, then contact an emergency dentist in Aurora or other healthcare facility right away. Some people’s teeth are too compacted to permit flossing. See your dentist for treatments that can help with this problem. Daily brushing and flossing are two of the smartest things anyone can do. So make this important practice a regular part of your life. We wish you a lifetime of happy smiles and vibrant dental health. Dr. Matt Mauck is not only a respected dentist, he’s also a former pro athlete. Dr. Mauck has played for the Chicago Cubs, the Denver Broncos, and the Tennessee Titans. His medical expertise, combined with his knowledge of sports medicine, gives him a hands up when it comes to taking care of his patients. You can reach Dr. Mauck online or by calling 303) 745-1400.